By this token, Hizbullah should be able to bomb where ever it wants in central Israel now that it has warned them in advance. Besides, people in Haifa have been warned for far too long. Therefore, any Hizbullah strike in Northern or Central Israel is a-okay, by Israeli standards, that is. fact: Hizbullah does not hide among civilians. Throughout this now 16-day-old war, Israeli planes high above civilian areas make decisions on what to bomb. They send huge bombs capable of killing things for hundreds of meters around their targets, and then blame the inevitable civilian deaths — the Lebanese government says 600 civilians have been killed so far — on “terrorists” who callously use the civilian infrastructure for protection. But this claim is almost always false. My own reporting and that of other journalists reveals that in fact Hezbollah fighters — as opposed to the much more numerous Hezbollah political members, and the vastly more numerous Hezbollah sympathizers — avoid civilians. Much smarter and better trained than the PLO and Hamas fighters, they know that if they mingle with civilians, they will sooner or later be betrayed by collaborators — as so many Palestinian militants have been. fact: Israel deliberately and indiscriminately targets civilians. ‘The overwhelming impression is that time and time and again civilians are attacked and only civilian infrastructure is targeted. In cases of civilian casualties our investigators have studied, they have not been able to find the presence of Hizbollah rockets or launchers – only civilian targets,’ she said. Just came across this comment piece by Greg Palast. He should stick to writing articles about vote fraud in the States and taking pictures in Venezuela, the guy comes across as an idiot when talking about the Middle East — and he admits it himself. There are things in this article that have merit, but the rest of it is utterly simplified and stupid. He ends up denying not just the Palestinians, but the Shi’ite Lebanese and the Israelis as well of agency and ignores the myriad motivations and distills everything down to oil (the chemical irony of this statement just hit me). Too tired to comment fully on it all. On Monday, July 24, there was a memorial to commemorate Black July, 1983 — where the Sri Lankan government and Sinhalese ethnic nationalists massacred thousands of Tamils in Sri Lanka. The massacres continue to this day, and so this was also a rally of defiance and protest. And it’s true. 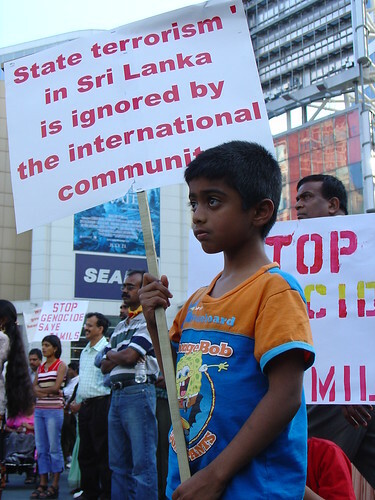 Most people largely ignore or are unaware of what’s going on in Sri Lanka. Click here for more pictures from the memorial/rally. I was eating a banana and a flashback from when I was a toddler hit me. My mother was “boasting” to my siblings about how I ate a banana all the way to the bottom (there’s this part of the banana at the very bottom that, in normal eating, gets left untouched unless you specifically eat it), and how fantastic that was. I know it made me really proud. Now I see my mother using similar tactics on my niece (who is three and a half). She “boasts” to me and others about how well she performs something (e.g., drinking milk), in order to encourage her to perpetuate that behaviour. This, of course, is positive social reinforcement. It was just now that I actually realized and connected the tactics my mother used on me to the ones she’s now using on her granddaughter. Funny how I never really, fully connected that before. I don’t eat bananas all the way down to the very bottom anymore. 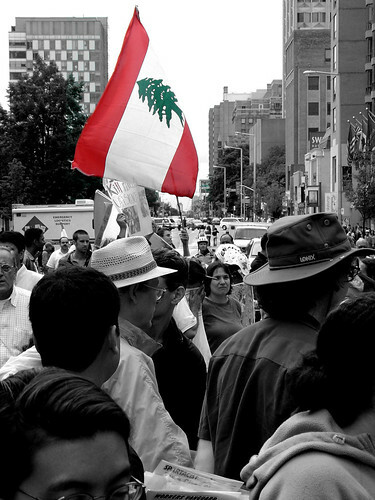 There was a rally yesterday Downtown, starting from the Israeli Consulate and ending at the U.S. Consulate, against Israel’s aggression in Palestine and Lebanon. Click here for more photographs from yesterday’s rally. The Transformers movie is coming out next July. It’s great to see all these cartoons of my boyhood come to the big screen. 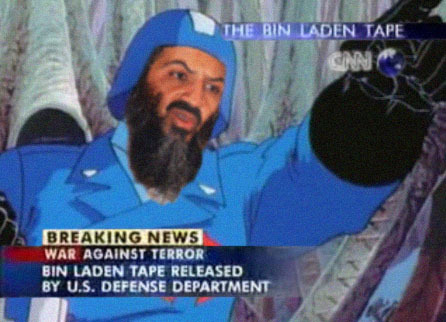 Next, I suppose, is G.I.JOE where, of course, the racially diverse and morally upright American soldiers triumph over irrationally evil terrorists (who hate peace and freedom) from the al-Coibra organization. Perfect. Thanks to M. for this trailer of TMNT, apparently coming out in March. No one outgrows the Ninja Turtles. Reminds me of this Lebanese guy I knew back in Saudi Arabia — we were both in the American Boy Scouts thing (don’t ask) — and he used to like the Ninja Turtles (it’s not like any of us didn’t). It was a while back, but I distinctly remember him wearing Ninja Turtles merchandise (a yellow shirt with the then cartoon version of TMNT, and I think matching shorts). I don’t remember his name or really anything else about him. I hope he’s okay, where ever he is. Why doesn’t every critic of Hizbullah, Hamas, Palestinian Authority, Palestinians, etc. automatically become an anti-Arab, or a racist, or pro-evil? Why is it that when someone criticizes Israel, they automatically become anti-Semites, racists, or unbalanced and unfair? Why don’t the former have to “equally condemn” the hundreds, thousands of Palestinian and Lebanese civilians who have been killed? Why is the onus on critics of Israel to also pause and “equally condemn” the Israeli civilians who have been killed? Why is it okay for Israel to act any which way it desires out of “self-defense” (or even when it isn’t defending itself), but not okay for Hamas to act against occupation? I just realized something about the video I posted below that didn’t strike me at first. The Outlandish video takes the occupation of Palestine and presents it through the familiar tale of Red Riding Hood and the Big Bad Wolf. However, the Israelis (and by extension Jews) are presented as wolves, whereas Palestinians are presented as humans. Even when the children are lined up at a checkpoint, a young Jew is presented as a young wolf (who passes through the checkpoint easily). When our protagonist is dreaming about a peaceful coexistence, the Jew is presented as a wolf. Perhaps the reason this didn’t strike me at first is because I’ve spent a lot of time looking into the texture and diversity of opinion within not just the Jewish community worldwide, but also within the Israeli community. The wolves thus just struck me as particularly aggressive racist Zionists, and not being representative of all Israelis and Jews (e.g., representing George W. Bush as a monkey doesn’t mean I believe all Americans, or even all Republicans, or even any one but Bush is a buffoon). But, on watching the video again, the wolf is repeatedly attached to the Jews, and only to Jews (even those who live in peace). Essentially, framing Jews as inherently aggressive, rabid, carnivorous, etc. Whether or not the makers of the video intended this so outrageously or even subtly, it does strike me as blatant anti-Semitism, and is inexcusable. Our job, our role is to actively prevent perpetuation of precisely these kinds of stereotypes that do disservice to everyone.